One does not wear Blue and Red after Labor Day. "Kryptonians in Black." New this fall on the CW. Just be happy it isn't electric blue. I'm a big boy today! This episode directed by Tim Burton. I miss Lex so much! Maybe if I wear his clothes for a while, it'll make me feel better. Random fan: Say, Jim, that's one bad outfit! Random fan: No seriously, that outfit is bad. 'Cause I don't see anyone else here. New Superman Director: Ok...we have listened to everyone's complaints on Superman Returns. Thanks to a ton of fan letters and comments across several websites we now understand what the fans really want. Director: Yes...we know you want something much darker. Director: It's obvious that the reason SR failed was it was too light and cheerie. Fan: Um..no...did you even read the websites? Director: Superman is dark and angsty. Fan: Um...have you ever even read a Superman comic? Director: I'm such a huge Superman fan. 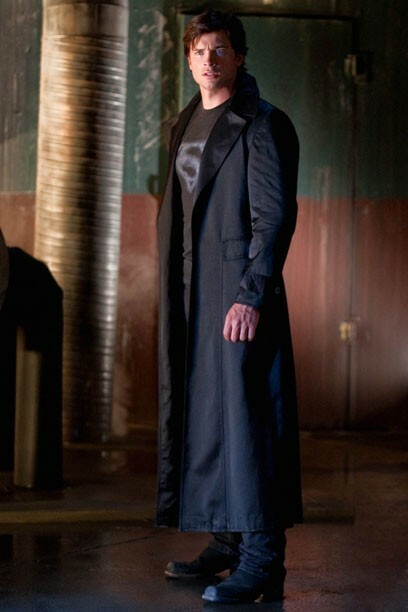 Director: So without further delay..I present you the new Superman costume. Director: Is that not the most badass costume you ever saw? Director: Oh it gets even better...Tom...show them the kryptonite swords! Fans lower their head into their hands.